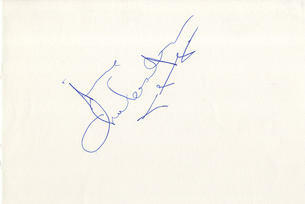 This is an In Person signed white card 5.75" x 4" by the Australian actress. Anne Charleston (born 1943 in Melbourne, Victoria) is an Australian actress currently based in Galway, Ireland and the UK. She is known for her roles as Madge Bishop in the Australian soap opera Neighbours and Lily Butterfield in Emmerdale.